You can find these cards in yellow-backed holders all around the Library. They’re also available at the desk by the Library reception, so why not grab one as you enter so you’ll have it ready when you need a break? 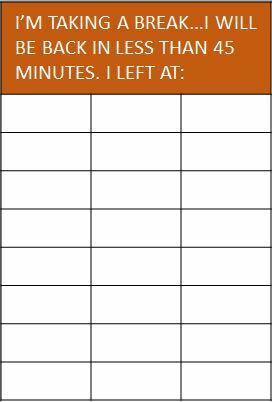 When taking a break of up to one hour: please always leave a card, fill in the time you left and be sure to return within 60 minutes. Don’t forget to take any valuable items with you or put them in a Forum Locker. How did we develop the scheme? Before we introduced the scheme , we did a lot of research about what other HE organisation were doing about the problems of people saving seats while they are away. In libraries of a similar size to ours, it can be almost impossible to successfully enforce any “no saving seats at all” rules. We needed to think around the problem in another way. We met with the Student Guild and they were clear that we needed a student led scheme that increased awareness and allowed some flexibility. 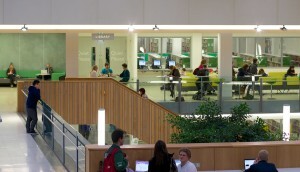 They also feel very strongly that the library should increase the number of study seats available over time. 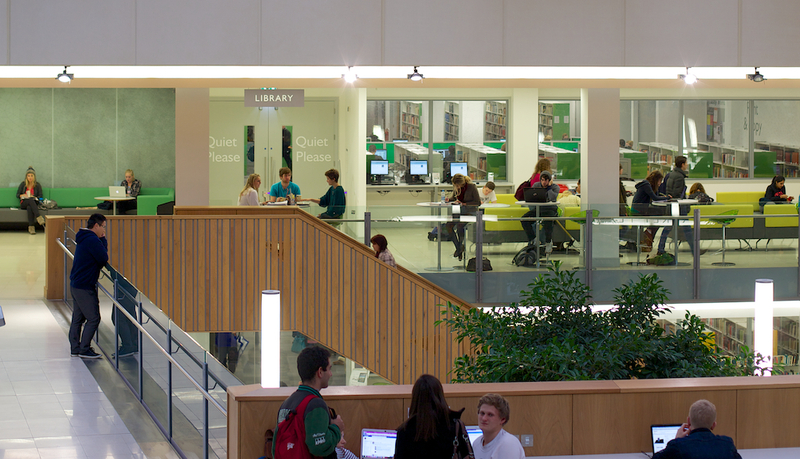 We were pleased to announce additional seats at the start of this academic year – and don’t forget that during the revision period the number of available seats in the Forum Library will increase again as the Seminar wings on Level 0 and Level +1 switch to become library spaces. 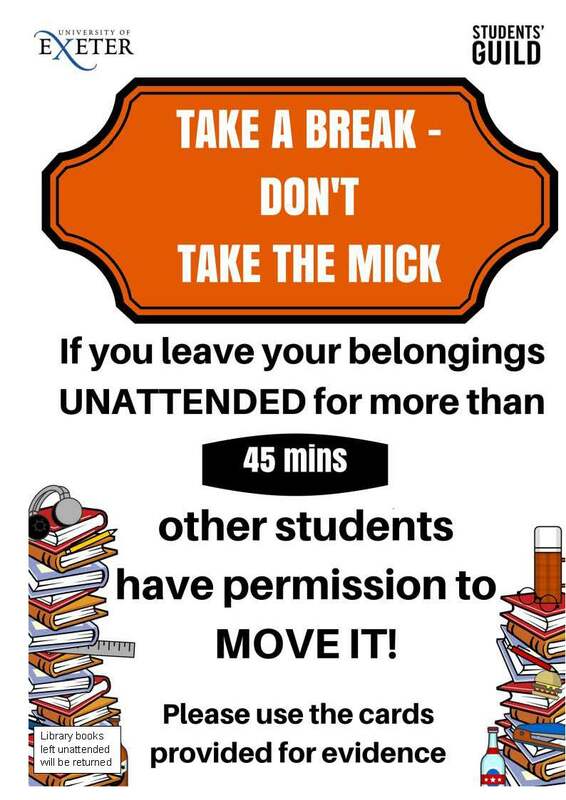 We also met with individual students who had complained about the problem of saving seats and together (with all this input) we came up with the “Take a Break” idea, as promoted. Thanks to everyone who has taken the time to get in touch with Library staff and share your thoughts on this scheme. Your feedback is appreciated and we’ve been pleased by your support. Here’s a selection of youe comments so far, as well as responses to some of your questions and concerns. Our response: Our front line team are working very hard to implement this new system and we think it may take at least a full academic year (or more) for the scheme to prove its worth. The Student Guild are also behind the scheme. It is a big change and needs sufficient time to become part of the culture. Our response: Both the Library and the Guild are keen to achieve the right sense of balance and to encourage healthy study habits. It is good practice to take breaks when working to get fresh air and to eat. Students need (at most) an hour to get lunch, especially if they have to buy food, queue or use the toilet. Also, students can leave for shorter periods; one hour is the maximum permitted time away. Library staff will do more work to promote this message. Some courses require students to spend a large proportion of their time in individual study (as opposed to in contact hours with academic staff). Many of you have told us that you prefer to spend this in the library as here you feel most motivated to get on with the work. Some students live off campus (or travel in on public transport) and it would not be practical for them to come in for short periods. They may need to work for long periods, fewer days per week. Many students explained that they need “library days” where they can work consistently on certain projects over extended periods. All of these are reasons why we feel it’s important to support extended study periods in our spaces. But we’re keen to do so in a healthy way, which includes allowing our users to take short breaks. We hope Library users will continue working with us to make this scheme a success. This entry was posted in Forum Library, Using the Library and tagged Forum Library, improvements, library behaviour, students, study spaces, You told us on 9th Dec, 2013 by reg206.